Not much is said about Abel, but he was the second male child of Adam and Eve. The name is probably related to Sumerian and Akkadian words meaning, ‘son’ and was thus used as a generic term for the human race. Abel’s older brother Cain, was engaged in agriculture, but Abel was a shepherd. Bother of the brothers brought offerings to the Lord, God accepted Abel, but rejected Cain. 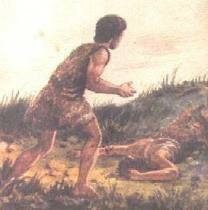 ‘It was by faith that abel brought a more acceptable offering to God than Cain did. God accepted Abel’s offering to show that he was a righteous man. And although Abel is long dead, he still speaks to us because of Faith”. So Abel surely should be include as a person of Faith, Like Abel, you and I come to Our Lord and Our Friend, not on the merit of what we bring him, but by Faith in Who He is.